Lander is a Utah based company focused on producing “expedition-inspired accessories.” We have previously reviewed one of their other products, the Cascade Powerbank. Lander offers the Cairn in three different sizes – the Mini Lantern, Lantern + Power Bank, and XL Smart Lantern + Power Bank. I will be reviewing the Lantern + Power Bank combination. 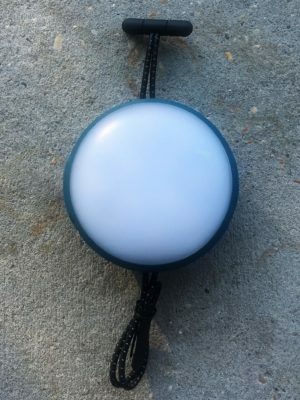 The light is about the size of a hockey puck and features an IP65 waterproof rating and an elastic tether system with reflective accents. Operation is simple with the Cairn Lantern, as there is only one button. One quick click to turn it on, press and hold to go to the low light setting and then continue holding to adjust the brightness level. I like the fact that the operation in simple with only one button, less to figure out or break. The Lantern charges with the included mini USB cord and has a protective rubber cover over the USB and mini USB ports. Just near the charging ports are five small lights that show the charge remaining with the light. I used the light a few times around the house and a couple of things stand out. The first is how bright the light is. The 300 lumens is almost blinding if I look at it. The second thing that I like about the light is the elastic Anchor System. I like that I can hang the light almost anywhere and be able to use it hands free. 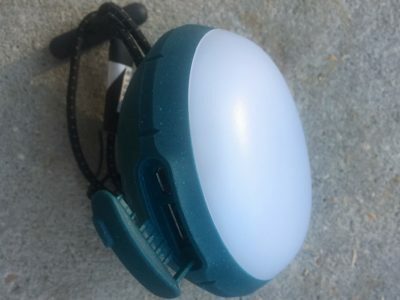 I will be using the Cairn Lantern + Power Bank on my camping and hiking trips over the next month or so to see how it performs. Please check back in about a month for an update.